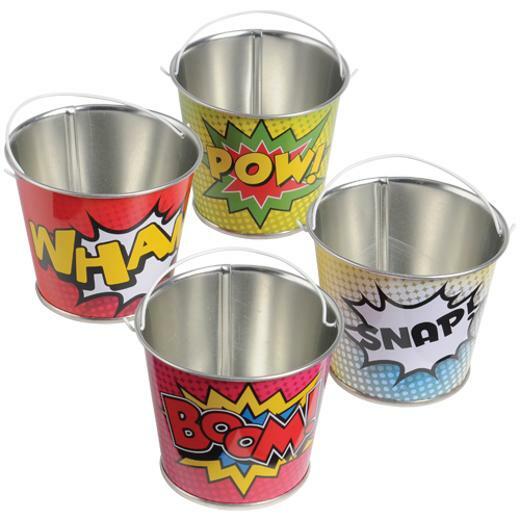 Cheap Superhero Mini Buckets - 12 Ct. Perfect for a superhero themed event! Give your guests a unique goody bag with these superhero-themed buckets. Each metal bucket holds party favors, candy or can be used as a placeholder. Inspired by the look of your favorite comics, these make a perfect decorative piece for your party table at your child's next superhero bash! L: 4.1 in. W: 4.0 in. H: 8.5 in.